Your donation can help open the door. Join the Family Resource Network for our 4th Annual Duck Derby Family Fun Day and 25th Anniversary Celebration!! Please join the Family Resource Network for an afternoon of fun at Neahwa Park! This year in addition to our traditional Duck Derby activities we will also have a special musical guest, Flame the Band, who will be performing at the Foothills Performing Arts Center immediately following the Duck Derby!! Flame is a group of musicians with powerful vocals, smooth harmonies and a rich array of instruments, the 8- person cover band from Gloversville, NY happens to have disabilities. Flame’s mission is to change the world through music. They inspire people with disabilities and give hope to them and their families – hope that they can do great things and live a fun and fulfilling life. Flame’s performances help change how the public perceives people with disabilities and increase the awareness and acceptance of all people, regardless of their differences. The Duck Derby will consist of multiple heats of duck races throughout the afternoon. CASH PRIZES will be awarded to first, second and third place finishers in each race. At the end of the day all ducks will be entered in the final race for a chance to win the grand prize!!! While Ducks can be purchased the day of the event, they can also be purchased in advance at the Family Resource Network located at 46 Oneida Street, Oneonta. Ducks are being sold for $5.00 each or 6 for $20.00! On the day of the event community agencies will set up with games and activities as well as passing out information about the services they offer! If your agency is interested in tabling please contact Kristin at the Family Resource Network at 607-432-0001. A portion of the funds raised by the Duck Derby will go directly to support individuals living with a disability through The Legacy Resource Fund. This is a fund created and managed by the Family Resource Network, Inc. to assist local families of children with disabilities with costs not covered by insurance. Some examples of items the Legacy Resource Fund has covered include: hotel and/or gas to and from doctor appointments that are out of the area; travel to disability specific conferences; medical equipment and/or modifications that are not covered by insurance or any other agency. 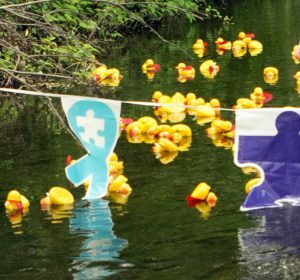 The Duck Derby is the Family Resource Network’s main fundraiser for the year. If you or your business is interested in taking part in this event through sponsorship and advertising opportunities please call our office at 607-432-0001 to learn more.